BERLIN (Reuters) – A towering figure of post-war European politics, Helmut Kohl pushed through German reunification and was a driving force behind the creation of the euro during a 16-year reign as German chancellor that spanned the tumultuous final decades of the 20th century. Kohl died on Friday morning at his home in Ludwigshafen, according to German media. He was 87. 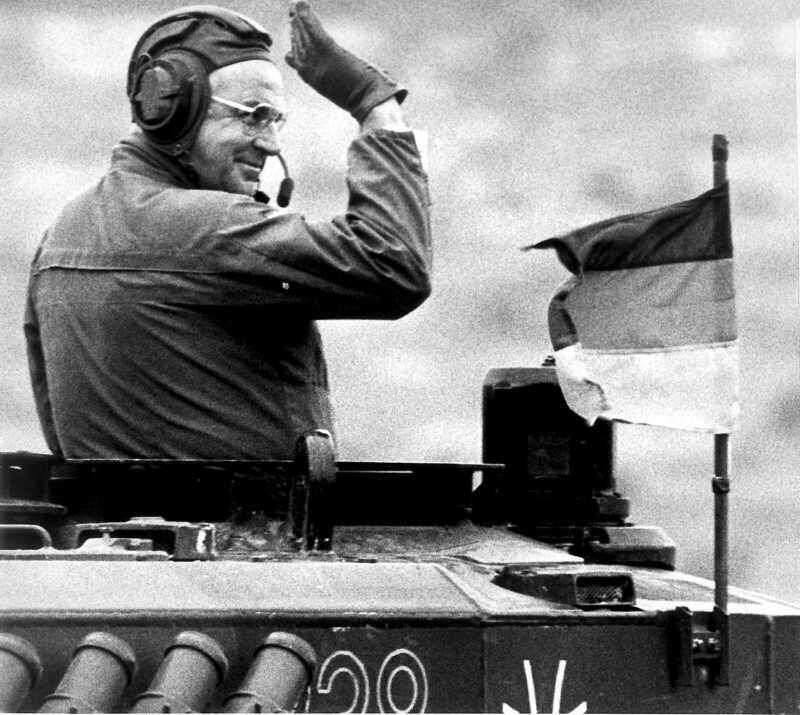 A bear of a man whose provincial accent and unvarnished folksy style led opponents to underestimate him in his early years, Kohl was a passionate advocate of European integration whose outlook was shaped by the two world wars that ravaged Europe and claimed the lives of his brother and uncle. Together with French President Francois Mitterrand, the enigmatic socialist with whom he developed an unlikely personal bond, Kohl helped steer a peaceful course for the continent during the twilight years of the Soviet Union, when the foundations of Europe’s post-war order crumbled and had to be reset. 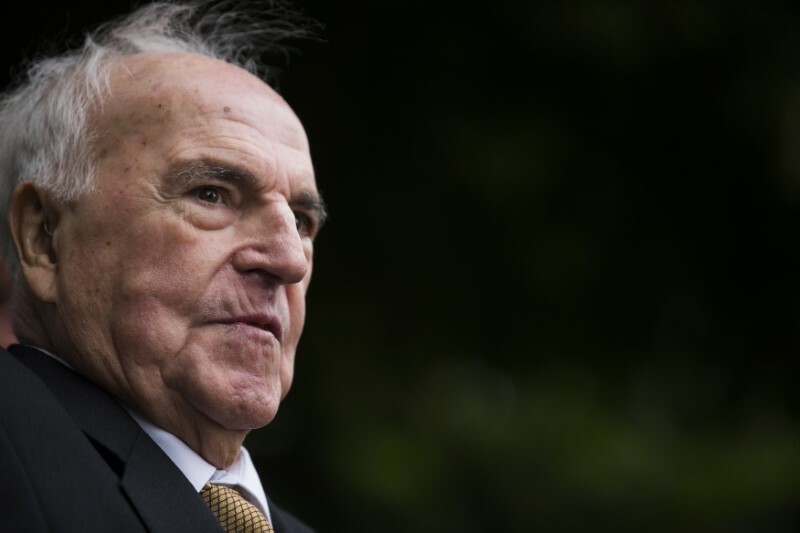 In a 2012 tribute, former U.S. President Bill Clinton described Kohl as one of post-war Europe’s defining statesmen. “His vision helped to usher the global community into the 21st century, to build bold and lasting relationships that endure to this day,” Clinton said. For all his accomplishments as chancellor, Kohl’s life was tinged by controversy and personal tragedy after he left office in 1998 as Germany’s longest-serving leader since Bismarck. In 2000, he was forced to resign as honorary chairman of the Christian Democratic Union (CDU), the party he had led for 25 years, after admitting to receiving $1 million in illegal cash donations during his time as chancellor, which he doled out to local party organisations at his whim. He refused to reveal where the money had come from, saying he had given the donors his “Ehrenwort”, or word of honour, not to disclose their names. The scandal made him a virtual pariah in his own party for years. Angela Merkel, the shy physicist from communist East Germany whom Kohl had plucked from obscurity to join his cabinet after the November 1989 fall of the Berlin Wall, turned on him at a crucial moment during the scandal, ensuring his exile. Ties between the two had been frosty ever since. A year after he was dropped by the CDU, Kohl’s first wife Hannelore, who suffered from a debilitating allergy to light, committed suicide. Kohl was born on April 3, 1930, the youngest of three children, in Ludwigshafen on the Rhine, a centre for the chemicals industry and one of the German cities most bombed during World War Two. Kohl’s parents are described in Hans-Peter Schwarz’s 2012 biography as sceptical of the Nazis in the early years of the regime and quiet critics later on. As practicing Catholics, they opposed Adolf Hitler’s rejection of religion and persecution of minorities. World War Two cast a dark shadow over Kohl’s youth. He recalled the death of his older brother Walter, killed in an aerial attack in Normandy in 1944, as a “life-changing experience” that shook the family. Walter had been named after an uncle who died in World War One. Years later, when Kohl decided to give his first son the same name, his mother asked whether he wasn’t tempting fate. “Mother, I promise you that he will not die in a war between European states,” Kohl recalled telling her. He often described his push for a united Europe as his way of delivering on this pledge. Just 15 when the war ended, Kohl was drafted into the army and served briefly in a military training camp near Berchtesgaden but never saw combat. He returned to devastated Ludwigshafen and began history and law studies. In 1959 he was elected to the regional assembly in Rhineland-Palatinate and a decade later, at the age of 39, he became premier of the state. In 1973, Kohl was elected chairman of the CDU, Germany’s largest conservative party, and, after narrowly losing in his first attempt in 1976, he became chancellor of West Germany in 1982 when the ruling coalition of Social Democrats (SPD) and Free Democrats (FDP) under Helmut Schmidt collapsed. At first, Kohl was ridiculed as a country bumpkin lacking the sophistication of predecessors such as Schmidt and Willy Brandt. Cartoonists depicted him as a giant pear, giving rise to his nickname “Birne”. But Kohl soon showed himself to be a skillful tactician. Defying the leftist German peace movement, he and his foreign minister, Hans-Dietrich Genscher, backed the deployment of U.S. intermediate-range nuclear missiles in Germany, winning friends in Washington. 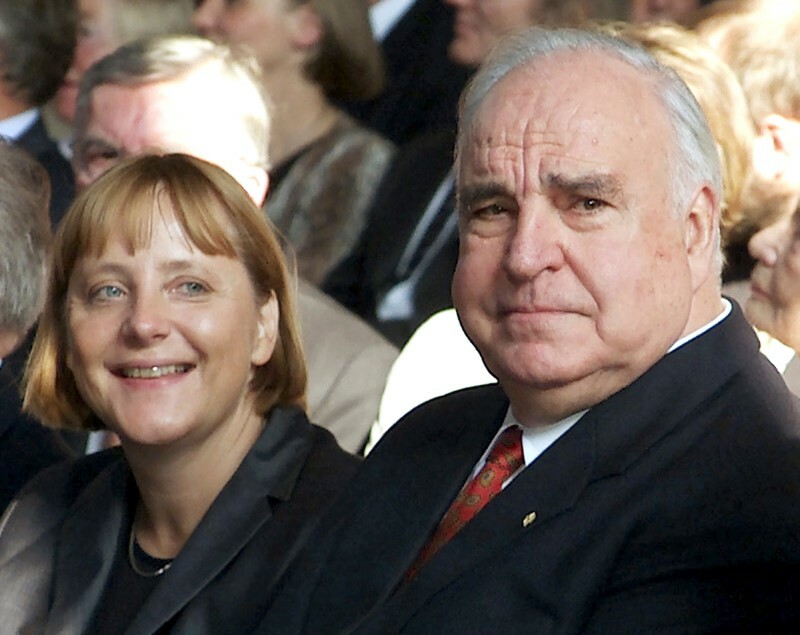 Kohl became known for wearing his opponents down by ignoring them, a strategy known in German as “aussitzen”, which has been mimicked by Merkel since she became chancellor in 2005. 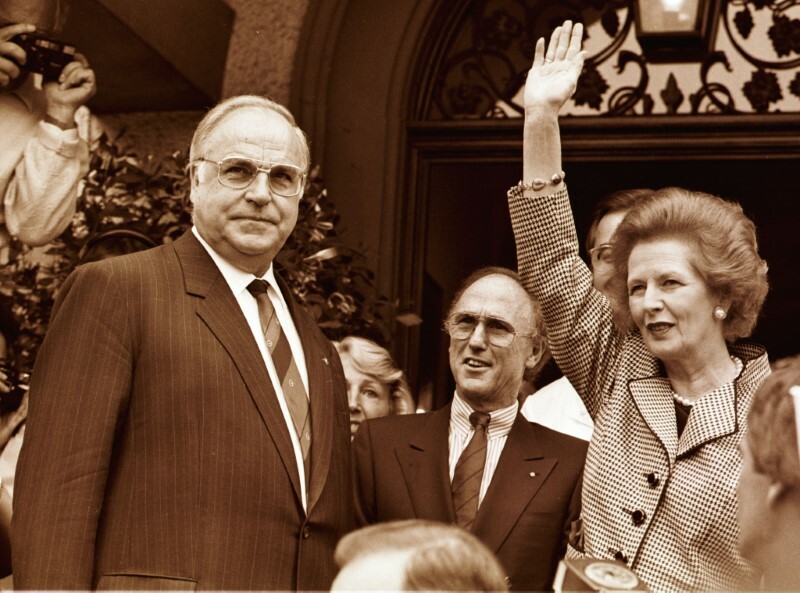 Former British Prime Minister Margaret Thatcher waves to well wishers as German Chancellor Helmut Kohl (L) looks on during Thatcher’s visit to Germany in this undated file photo. About 60.5 million eligible Germans are called to vote for a new parliament in general elections on Sunday September 27. Kohl’s finest hour came in the months after the fall of the Berlin Wall, when he was able to overcome the hostility of Western allies to unify the communist east and capitalist west. 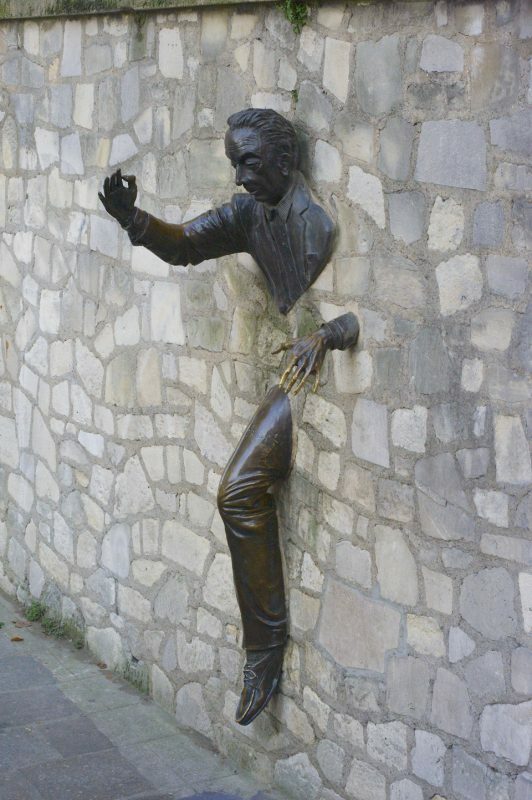 The breaching of the Wall on Nov. 9, 1989, caught the West German political establishment and the rest of the world off-guard. Kohl was getting ready to sit down for a banquet dinner in Warsaw when he was alerted to the dramatic events by his office in Bonn. He flew to Berlin the next day and, sensing the euphoria at home, soon began work on a 10-point plan for German unification that he presented to the Bundestag on Nov. 28. The speech, typed by his wife Hannelore on a typewriter at home to prevent leaks to the media, came as a total surprise to Germany’s allies. U.S. President George H.W. Bush was supportive, but European partners seethed. “Your friend Kohl, your partner, is a hick from the countryside!” fumed Gorbachev in a private meeting with Mitterrand in Kiev a week later. Thatcher was also furious. “Kohl is capable of anything,” she told France’s ambassador to Britain. Like the British leader, Mitterrand, a former prisoner of war under the Nazis, was worried about how far German ambitions might go. Five years earlier in 1984, the French president had linked hands with Kohl on the battlefield near Verdun where Kohl’s uncle had died in the First World War and Mitterrand had been taken prisoner in the Second, creating an iconic image of European reconciliation reprinted in countless history books. German reunification was another matter. Nevertheless, Kohl was able to win over Mitterrand. At a summit in Strasbourg a month after the Wall fell, described by Kohl as the most “tense and unfriendly” he had ever attended, he agreed to start serious negotiations on European monetary union, setting the stage for the creation of the euro. Kohl’s commitment to anchor a united Germany within Europe, and his pledge months later to accept the Oder-Neisse line, the German-Polish border set after World War Two, ensured French support for unification. To convince Gorbachev, Kohl pledged billions of marks to pay for the withdrawal of Soviet troops from East Germany and the costs of resettling them at home. “Throughout 1989 and 1990, Helmut Kohl showed uncommon vision and courage when he seized on the fall of the Berlin Wall to work for German unification,” Bush said decades later. The fall of the Berlin Wall and the march towards unification were a political boon for Kohl, whose popularity had been slumping, forcing him to fight off a putsch attempt by CDU rivals in early 1989. Ignoring warnings from the German Bundesbank, he rammed through a 1-to-1 conversion rate of east German wages and pensions into west German marks, and easily won re-election in 1990 as “the chancellor of unity”. Kohl promised east Germans “flourishing landscapes” but the “Aufschwung Ost” – or eastern economic recovery – proved far slower and more painful than he had imagined. The conversion rate increased unemployment in the East, pushed up inflation in the West, and led to higher interest rates across Europe as Germany borrowed massively to finance reconstruction. The economic hangover from unification and policy inertia in the decade that followed had, by the end of the millennium, turned Germany into the “sick man of Europe”. Kohl tried to win a fifth term in 1998 instead of making way for his groomed successor Wolfgang Schaeuble, who polls suggested had a better chance. He lost the election to Social Democrat Gerhard Schroeder, who was forced to introduce far-reaching reforms in response to Germany’s economic woes. A year later, the party funding scandal erupted and Kohl was pushed out as honorary chairman of the CDU. His wife’s suicide the following year exposed him to accusations of neglect, including from his eldest son Walter, who later wrote a tell-all book about the family. Kohl suffered a bad fall in 2008 and from then on was confined to a wheelchair, and had trouble speaking. He rarely appeared in public and his second wife, Maike Kohl-Richter, was criticised in the German media for zealously shielding him from his sons and old friends. Kohl’s biggest achievement, German reunification, looks more of a success today than it did in its first decades. Eastern Germany still lags behind the west in many economic measures, but the gap is narrowing and cities such as Leipzig and Dresden are thriving. Twenty-seven years after east and west merged, Germany is prosperous and increasingly influential on the international stage. Kohl’s other landmark accomplishment, pushing through the euro despite widespread public reservations, was hailed as a triumph in the currency’s first decade, but now looks less glorious after years of crisis. Some in Germany now blame Kohl for pursuing the euro without insisting first on closer political and fiscal integration – a decision Merkel has denounced publicly as an epic mistake. In his 2014 book “Out of Concern for Europe”, Kohl blamed the single currency bloc’s woes on Schroeder’s decision to let Greece into the euro zone and his watering-down of EU budget rules. In an appearance at the German Historical Museum in Berlin in 2012 to mark 30 years since he became chancellor, Kohl reminded his audience of why he had championed European unity and urged EU leaders to continue on the path of closer integration despite the crisis of the euro. Related on F&O: Focus on the Berlin Wall, November, 2014: Germany, and much of the world, marked the 25th anniversary of the fall of the Berlin Wall. Will 2017 bring surprises for European integration? There can be little doubt that this year’s elections in Germany and France may determine the future of the European Union. For nearly a decade now, the EU has been facing unprecedented challenges, from the euro crisis and the influx of migrants to Brexit and the rise of nationalism. On their own, any one of these crises could threaten the cohesion of the union; together they represent an existential threat. But the tide could yet turn. Depending on the outcomes of the French and German elections, 2017 could actually be the start a more integrated and unified Europe. France is facing one of its most fascinating election in recent history. Former prime minister François Fillon, a traditional conservative, looked likely to win power. But an embarrassing corruption scandal involving the employment of his wife Penelope has significantly dented his chances. The Socialist candidate, Benoît Hamon, is highly unlikely to make it far. Having won the socialist primary on a very left-wing platform, it will be difficult for him to reach beyond his core group of supporters. Leading the polls is Marine Le Pen, the leader of the far-right Front National, who is running on a populist, eurosceptic, anti-immigrant platform. Le Pen is projected to win the first round of voting on April 23, but she is most likely to be knocked out in the second round, where 50% of voters are required to win. The man who defeats Le Pen in the May 7 second round may not come from either of France’s main parties. Emmanuel Macron is now one of the favourites to win the elections. Macron’s political success has come incredibly fast. An unknown three years ago, he is now on track of possibly becoming the youngest president of the Fifth Republic, at age 39. As a minister, Macron was vocally pro-business, in conflict with the classical tenets of the French left: he defended Uber, the opening of shops on Sunday and the reduction of the costs to terminate labour contracts. He became very popular with the French public while finding himself at loggerheads with many figures of the ruling Socialist party. In August 2016 he quit the government and launched a presidential bid as an independent. Half a year later, he has transformed his initial political start-up into a political movement, En Marche (Forward), with political rallies that attract thousands. His strength comes from the match between his discourse and French voters’ desire for change. His left-liberal political position would not be unusual in many Northern European countries, but in France it is a novelty. Nearly 30 years after the fall of the Berlin Wall, the French left has not adapted to economic modernity. Facing the competition of a strong Communist Party in postwar France, the Socialist Party maintained a traditionally anti-capitalist position. This ideological position has often been disconnected from social-liberal policies adopted once in government. By seizing on these contradictions and crossing the left-right divide, Macron has thrived. His novel political platform is characterised by an economic liberalism blended with concern for social justice and political and cultural liberalism. Young, charismatic and intellectual, Macron has attracted people from both the left and the right, and drawn a lot of newcomers to politics. At the same time, political space has opened for him. Both Fillon and Hamon are hard-line candidates, leaving an spot in the centre for Macron. A Macron victory would have important consequences for the EU. Unlike most French politicians, who are either shy integrationists or vocal eurosceptics, he is strongly pro-EU; his supporters cheer for Europe in political meetings. In January, he wrote in the Financial Times that it was time for Europeans to become sovereign. This stance could end French opposition to deeper political integration. The election of Marine Le Pen would lead to the unravelling of the EU, but if France chooses Macron, the union will get a significant boost from one of its core members. The other key country in holding the EU together is of course Germany, which goes to the polls on September 24. Angela Merkel, of the Christian Democratic Union, is running for her fourth term as chancellor. Hoping to dislodge Merkel from the Bundestag is Martin Schulz of the Social Democratic Party (SPD). In January, the none-too-popular Sigmar Gabriel made way for Schulz to become the part’s lead candidate. Schulz is a rarity in European politics, having made his career in the EU before vying for a top national position. A member of the European Parliament since 1994, Schulz was its president from 2012 to January 2017. There, he helped stage a political coup that dramatically shifted the balance of EU institutions, transferring power from the Head of States (Council) to the Parliament, and through it to European voters. In 2010, the Party of European Socialists decided to name a leading candidate to become the president of the European Commission in case of victory at the 2014 European elections, and chose Schulz. But the European elections in May 2014 did not deliver a clear majority. Schulz could have tried to form a majority on the left, but he instead supported a cross-bench motion from the European Parliament stating that conservative candidate Jean-Claude Juncker was the winner of the election and that he had to be nominated. Schulz understood the political game he was facing. The Council wanted to keep nominating the president, and the lack of a clear majority gave it the opportunity to propose another candidate. Schulz’s decision to withdraw gave the Parliament the upper hand instead. At the time, Merkel seemed to indicate that she would not support Juncker. She faced a storm of criticism in the German media and was accused of betraying the democratic promise of the election. Soon after, she caved and endorsed Juncker. Martin Schulz’s key role in this manoeuvre indicates that as chancellor he would probably leverage Germany’s power to further EU integration. It would mark a substantial change compared to Merkel, whose approach has been to take as few steps as necessary and to protect German finances before all. Could Macron or Schulz have an impact on European integration? Most likely. Many factors in the current context are pushing in that direction. Politically, the lack of accountability and transparency of decisions at the European level is feeding a rise of nationalism; that threatens many European governments. Geopolitically, we are witnessing both a resurgence of Russian military threat and a withdrawal and unpredictability of the US ally under Trump. Economically, crises are clearly calling for better coordination. But the hurdles to further integration are lower than we think. Brexit will remove from the EU the country most opposed to closer political union. Among the remaining countries, Europeans are often said to be against further integration. But this statement confuses a criticism of current institutions with a criticism of integration. Eurobameter studies show year after year that EU citizens support more integration in matters where nations cannot be the solution, such as defence. They also support more democracy at the European level, such as the election of the president of the European Commission. A deeper political union may actually be closer than it seems. Without any treaty change required, the European Commission presidential nomination process has the potential to radically change the nature of European politics by creating a pan-European debate about European policies. The only thing needed for a leap towards further political integration is for the French and German heads of state to support it. This year may just deliver that. Lionel Page is a Professor in Economics at Queensland University of Technology. This article was originally published on The Conversation. Read the original article. 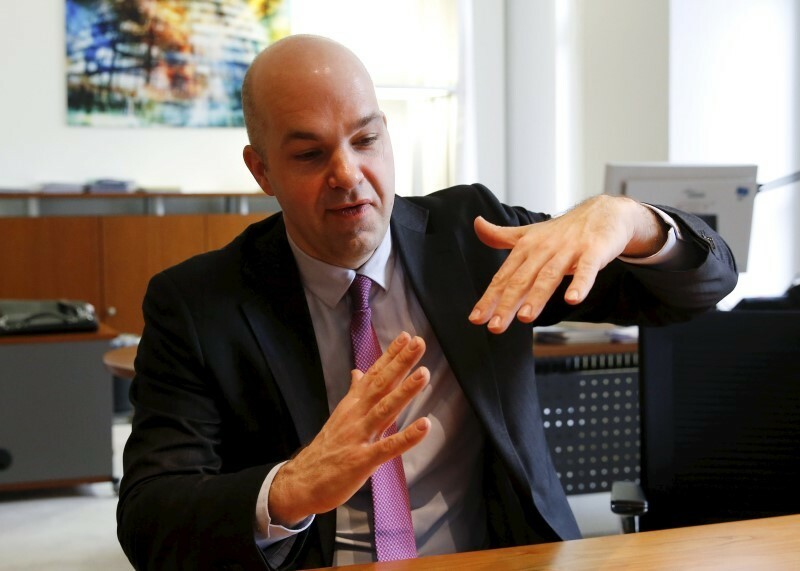 BERLIN (Reuters) – Marcel Fratzscher is not your typical German economist. Educated at Oxford and Harvard, he often writes the first drafts of his papers in English. When asked whose work inspired him, he names Amartya Sen, a Nobel Prize-winning Indian economist and philosopher. And in contrast to many of his domestic counterparts, Fratzscher does not believe the German economy and the special brand of rules-based governance – Ordnungspolitik – that has shaped it since World War Two is a model that others should emulate. In fact, the 45-year-old president of the German Institute for Economic Research (DIW) in Berlin, has made a name for himself in recent years by exposing flaws in the German economy and daring policymakers to fix them. In his 2014 book “Die Deutschland Illusion”, he argued that what was being hailed by politicians and the media as a second German economic miracle was little more than a mirage that masked deep-seated problems, including a massive investment shortage that had left German roads and bridges crumbling. The ensuing debate prompted reluctant Finance Minister Wolfgang Schaeuble to earmark funds for infrastructure. On Monday March 14, Fratzscher releases a new book, called “Verteilungskampf” (The Distribution Battle), which tackles what he says is another fantasy: the notion that Germany is a nirvana of economic and social equality – more caring Scandinavia than callous United States. In the book he calls Germany a country of “enormous inequality” in which income, wealth and opportunities are distributed “more unequally than in almost any other industrialised country”. “We live in denial in Germany,” Fratzscher said in an interview in his Berlin office near the Gendarmenmarkt square. Some economists may challenge his argument. Germans earn more per capita than virtually all of their European counterparts, have one of the highest savings rates in the bloc and are enjoying record-high employment levels. A report by the Paris-based Organisation for Economic Cooperation and Development (OECD) last year showed Germany scored better than average on most measures of inequality. 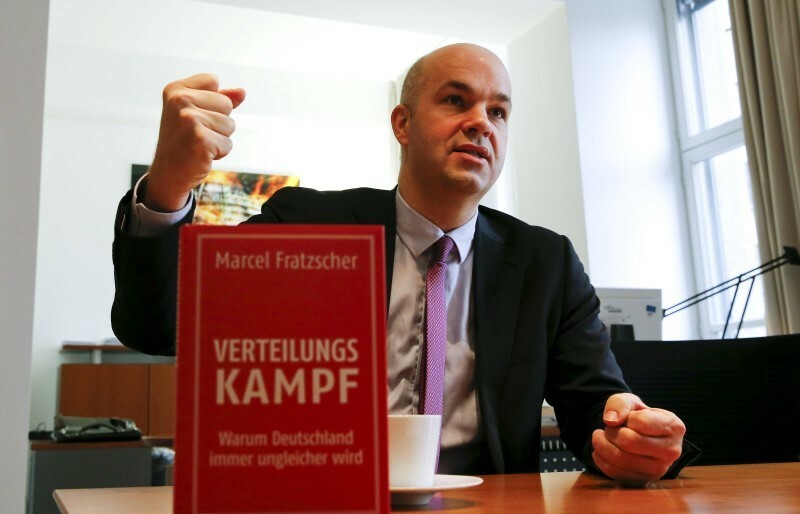 But Fratzscher clearly hopes the book will encourage politicians to tackle reforms of the German education and tax systems, which he says have fuelled inequality. It seems sure to make waves at a time when many Germans are worried that an influx of refugees could erode their living standards. On Saturday, Der Spiegel magazine did a cover story linked to the book with the title: “Divided Nation”. “Germany in 2016: the rich are getting richer and the poor remain poor,” Spiegel said. Before you continue: please know that reader-supported Facts and Opinions is employee-owned and ad-free. We are on an honour system and survive only because readers like you pay at least 27 cents per story. See below, or find more details here. Thanks for your interest and support. “Verteilungskampf” also establishes Fratzscher, who ran the international policy analysis division at the European Central Bank (ECB) before joining the DIW in 2013, as one of the most influential economists in Germany – a successor of sorts to Hans-Werner Sinn, the president of the Munich-based Ifo institute, who is due to retire at the end of March. Sinn, with his signature chin strap beard, has been a staunch defender of German orthodoxy. He opposed bailouts for Greece and other struggling euro members during the bloc’s financial crisis and condemned steps by the ECB to stem the turmoil, sometimes finding support from politicians like Schaeuble. Fratzscher is the anti-Sinn. He broke with the mainstream in lauding the economic benefits of the euro at the height of the crisis and now talks about how an influx of hundreds of thousands of refugees will be good for German growth. His stances have drawn criticism from conservative voices such as the Frankfurter Allgemeine Zeitung newspaper. In the world of German economists, some view him as an apostate. “He’s one of the few economists in Germany who is challenging the traditional conservative view represented by people like Sinn,” said Henrik Enderlein, a professor of political economy at the Hertie School of Governance. Fratzscher jokingly refers to himself as a “bad German” because he studied abroad. “If there is a common thread to my books it’s the message that Germany has been somewhat arrogant, that it has been deluding itself,” Fratzscher said. In the early years of the 20th century, Germany saw that Britain had had to deploy the full weight of its empire to defeat the Afrikaners in the two Boer wars. Berlin judged the days of Britain’s super power status were approaching their end. It launched an arms race and a flurry of provocations against Britain and its allies, which cascaded out of control into the First World War. *Please note, a $1 day pass or subscription is required to access premium work on F&O.